Because the neck bears against the rim of the banjo a ledge needs to be cut into the neck to allow the tension room to sit down over the rim without running into the neck. I call this ledge the banjo neck heel tension hoop rabbet. It makes a space for the tension hoop at the place where the neck meets the rim and can be seen clearly back in the Dowel Stick section. 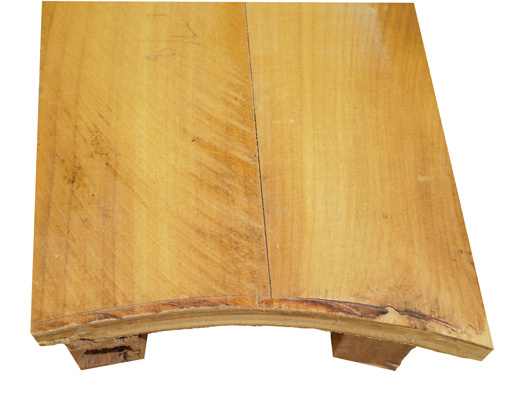 It is cut with the router using a jig that can be made using the tension hoop itself as a guide. The tension hoop rabbet should be as near to the thickness of the tension hoop as possible. It should be deep enough to allow the tension hoop to be tightened fully, which is usually a little more than 1/2″. The jig should be built with a wedge so that the tension hoop rabbet will reflect the angle at which the neck meets the rim. The bottom side of the tension hoop rabbet cutting jig. The edge of the tension hoop rabbet jig that the router will bear against.